September 27th, Arizona: Two men from Peoria and Phoenix were charged on Monday with killing an endangered Mexican gray wolf last December in a national forest in eastern Arizona. Under the Endangered Species Act, it is illegal to kill, a threatened or endangered species. September 27th, Michigan: Two adult wolves from Minnesota were captured and transferred to Isle Royale National Park Wednesday in the first phase of a project to rebuild the predator’s population on the wilderness island in Lake Superior. Park Service officials said they hope to capture four or more wolves in Minnesota, plus more from northern Michigan, in order to maximize the genetic diversity of the island’s future population. September 25th, Washington: An animal bridge in the State of Washington is scheduled for completion next spring. It will be the first critters-only overpass on busy Interstate 90. A pair of wildlife underpasses are part of this phase as well, one of which is already done. Deer have already begun using an unfinished section of the bridge. September 24th, New York: South Salem's Wolf Conservation Center says Atka , an arctic wolf that had long served as a wildlife ambassador, died peacefully over the weekend. The center says Akta leaves a huge impact on wolf conservation efforts and he will be missed. September 20th, Washington: According to the Washington State Department of Fish & Wildlife, a sharpshooter hired by the agency has killed a young member of the Old Profanity Territory wolf pack. The young wolf that was killed only weighed about 50 pounds. The killing was ordered after an adult cow had been killed allegedly by wolves nearby. September 20th: The Center for Biological Diversity has filed a notice of intent to sue the U.S. Fish and Wildlife Service for violating the Endangered Species Act by never developing a comprehensive recovery plan for gray wolves nationwide. "If successful, our lawsuit would require the federal government to foster wolf populations in suitable areas across the country, rather than rush to prematurely remove safeguards." according to Collette Adkins, Minnesota-based attorney for the Center for Biological Diversity. September 15th: Two endangered Mexican gray wolves, one in Arizona and one in New Mexico, have been found dead. An investigation is under way to determine the cause of death. 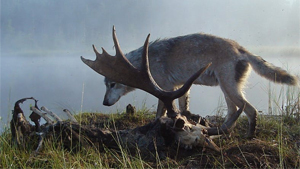 September 12th, Washington: Department of Fish and Wildlife Director Kelly Susewind has authorized the killing of another wolf pack in Northwest Washington. The pack does not yet have a name, but it's being blamed for a handful of livestock depredations. The pack is roaming the same range where the state has already killed wolves from two other packs in the past two years, making this the third year in a row a pack has faced lethal action. September 4th: Wolves once roamed the continent freely ... but as more and more humans came along and with them, livestock, wolf populations began to dwindle. In Yellowstone, the last of the park's gray wolves were killed in 1926. Now with the reintroduction of wolves into Yellowstone, there is the emergence of a more normal ecosystem and one that will support greater biodiversity. September 2nd, Washington: Amaroq Weiss, a wolf advocate with the Center for Biological Diversity, said the killing could trigger more wolf-livestock conflicts, as the female wolf left in the Togo pack may seek out livestock as easier prey in order to sustain the rest of the pack. Weiss said the center is proceeding with its lawsuit that argues the state is improperly issuing kill orders. September 1st, Wyoming: Idaho and Wyoming had been scheduled to hold their first grizzly hunts in more than 40 years in the mountainous region surrounding Yellowstone National Park. At the request of wildlife advocates and Native American tribes, a federal judge in Montana on Thursday blocked the hunts for 14 days while he considers whether protections for the bears should be restored. September 1st, Connecticut: A rare red wolf, named Peanut, who came from the Wolf Conservation Center in South Salem, New York, is now at the Beardsley Zoo in Bridgeport. He joins the zoo’s female red wolf, Shy, who has been living at the city’s zoo since 2016.